... are a girl's best friend... you know what I'm talking about? ;) I've not ever seen the movie. I'm thinking it's a movie. Right? With Marilyn Monroe and whoever else is in it. Or is it just another music video like Madonna redid? I really don't know! lol *blush* But I saw Diamonds are a Girls Best Friend image at Sassy Studios Design and I had to have it! I made the card to participate in two challenges. The second challenge is an Anything Goes challenge! I love these too! Who doesn't right? It's Challenge #19 over at Challenges 4 Everybody. 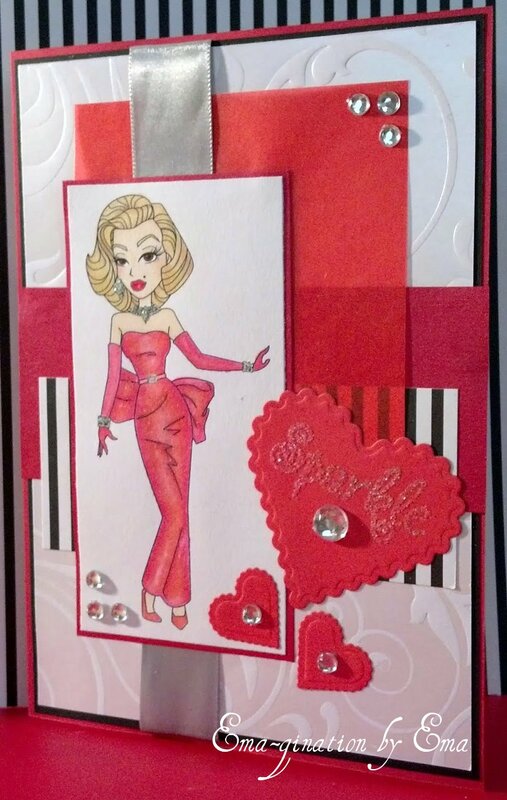 All plain and embossed card stock, vellum, shimmer and printed paper, ribbon and rhinestones are from my stash. The embossed scalloped hearts are from Spellbinders' Classic Scalloped Hearts die. The "Sparkle" sentiment is from a Raisin Boat clear stamp set called Wonderland Wishes. I stamped the sentiment with The Essential Glue Pad, sprinkled it with Cat's Stick 'Um Potion (I couldn't find a link for you! ), heated it per the instructions and added Stampendous Crystal Snow glitter for the "sparkle". :) Of course, I colored the image with Copic markers. :) I dabbed Stickles in Diamonds on all her jewelry. The belt buckle was colored in with a silver gel pen. Like I said before, I love this theme! You have such an eye for detail!